Knitting With a "Y": The Accounts of a Male Knitter: Thank You! On Monday I received a very nice package in the mail containing some wonderful fiber. Anne, Bunnyspinner over on Ravelry, from the blog How The West Was Spun, was so incredibly generous to send me some fiber she had sitting around in her - get this - room full of fiber. I'm still not over that. Anyway, she has a wonderful blog that you should all check out. I love reading it because it's like a peek into a world that is completely different than mine. She talks about spinning and knitting, but also about her horses, for which she has recently closed (or is in the process of closing) her etsy shop so she can devote more of her time to training. As a student musician with my nose constantly stuck in books about the history of the string quartet, or an in-depth analysis of the relation between key centers and their corresponding Affekts, it's wonderful and interesting to read about taking horses on 20 mile rides or preparing for a 50 mile trail ride/race. Totally different life, and I am so intrigued. She does still have some yarn posted in her etsy shop by the way, y'all should check it out. The first bit of fiber in the package is 2 oz. 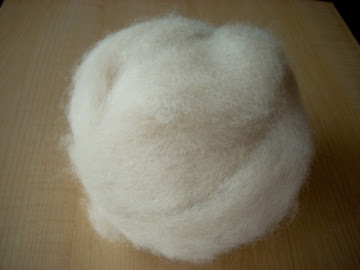 of a beautiful alpaca/angora blend. The angora is from her own bunny and the alpaca came from one of her friends out east. This may be the softest thing I have ever felt. Honestly, I want to use it as a pillow instead of spinning it up, or perhaps simply carry it around with me at all times in my bag so it's never more than an arm's reach away. In reality though, I can't wait to start spinning it. The second thing in the package was 4 oz. 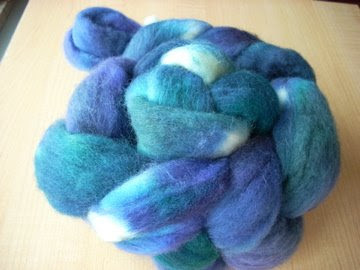 of gorgeous hand-dyed BFL (Anne, did you dye this yourself?) The blues and dark greens are just perfect for me (in fact they happen to be the exact colors I'm wearing right now) and I can't wait to see what they look like all spun up. I'm so incredibly excited about this fiber. Also, on a much less exciting or important note, I finished Ishbel. I'll post more pictures and details once I have better pictures. I'm sending it off to my little sister who turned 9 this past Sunday. I figured she would enjoy the bright colors of it and she can use it when she and my 10-year-old niece (oh my gosh, is she turning 11 next month?!) get together and inevitably play dress up and pretend they're fairies. What a wonderful package! Isn't Anne wonderful? I love that lace. Well done! 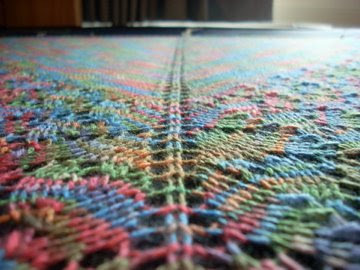 J will be super excited to get that shawl - expect a Skype call so she can show it off! The dyed roving is a no-name color, just a sample batch to try out a colorway and some fiber from a new wholesale provider. Hank was my biggest bunny - a real character. He had his picture featured in a copy of the Wild Fibers magazine a few years ago too! Anne is such as generous spirit! How exciting to get such wonderful mail. You're an awesome brother to give your sister a shawl. I'm sure she'll love it.